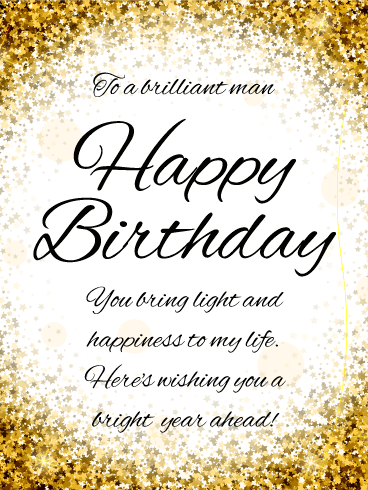 Every fantastic man deserves to be celebrated on his birthday...and this birthday card is the perfect way to do it! With a classic red car below and a special message above, it's a great way to remind him how much he means to all the people around him...especially you! Happy Birthday to a fantastic man! You're a true classic in every way. Here's hoping your year ahead is filled with many exciting adventures! 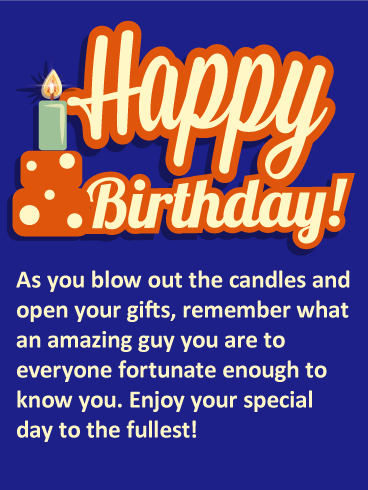 A big, bold "Happy Birthday" greeting will be the first thing he sees, along with a festive candle alongside, reminding him that you're wishing him well! Whatever age he's turning this year, he's sure to appreciate the kind, thoughtful words as he celebrates. What a great surprise for any special guy in your life! Raise a toast to the man of the hour on his birthday! 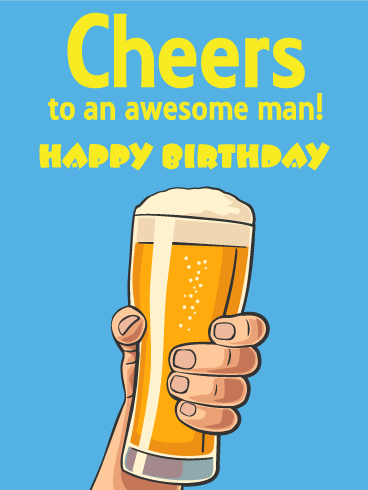 This cheerful card has a simple wish for him to sit back and enjoy every minute of his celebration. 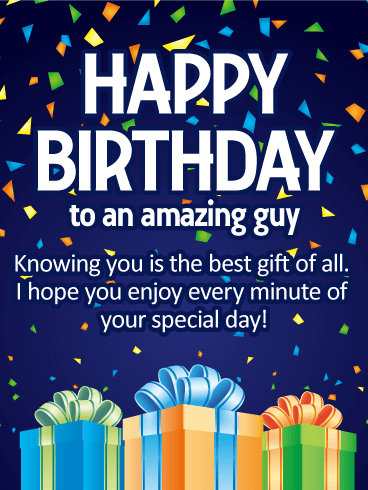 Whether he's relaxing with family or having a big party, this birthday card is sure to make him feel like #1! 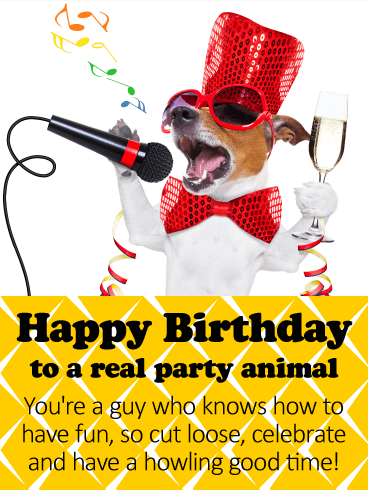 This funny card was created to wish any party animal a happy birthday! A doggie decked out in a sequined hat and bow tie, drink in one paw, mic in the other, is having a "howling good time" belting out his favorite song. And that's exactly the kind of fun you want the birthday boy to have on his big day…while remembering how much he means to his family and friends! 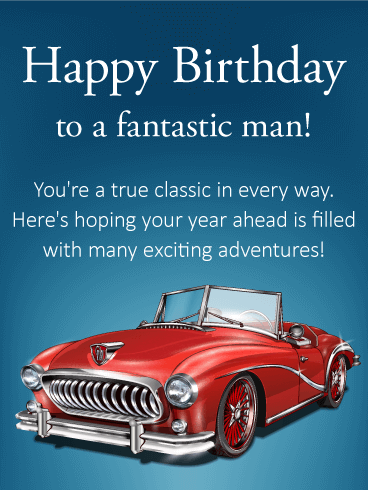 A brilliant gold card is the best way to celebrate a brilliant man in your life on his birthday! Whether he's a special family member or friend, this sentimental greeting will let him know how much of an impact he has on your life while wishing him "a bright year ahead!" No matter how near or far you may be, he'll always remember your kindness on this day. He's always dressed to the nines. He exudes class and charm. 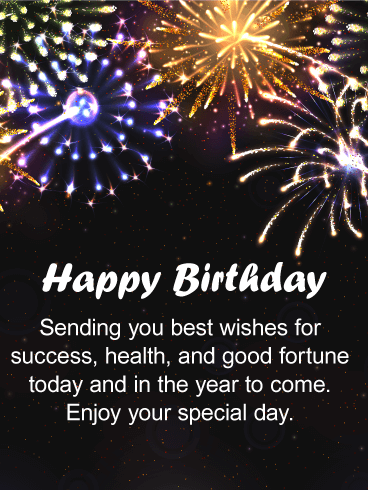 What better way to celebrate his birthday than by sending this sleek, stylish birthday card! 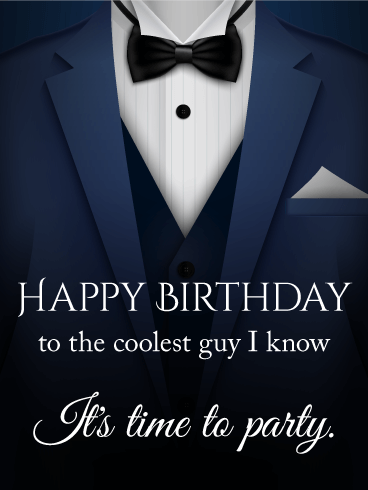 Specially created for the "coolest guy" you know, this birthday card will put him in the mood to put on his best suit and party! 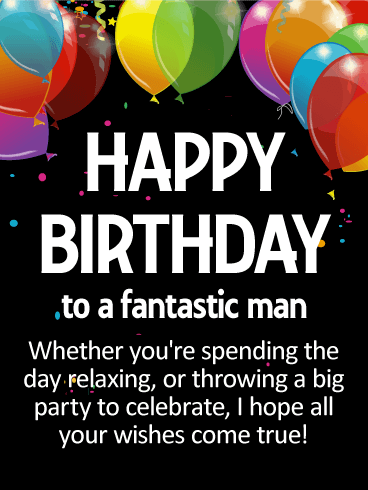 This festive birthday card for a "fantastic man" features a solid black background with bright, colorful balloons floating above. The words below will remind him to enjoy his day to the fullest. Whether that's relaxing at home or celebrating at a big party in his honor, you can be sure he'll enjoy seeing this greeting and knowing you took the time to remember him! 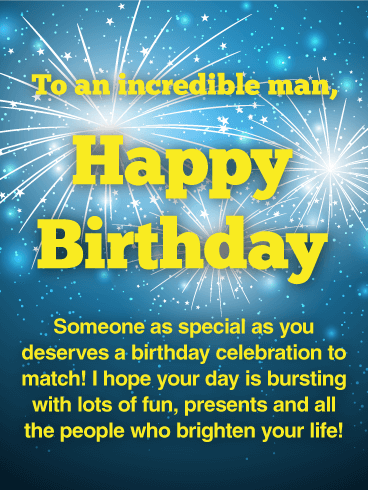 This big, bold birthday card will have the incredible man in your life feeling very special indeed! A night sky bursting with stars and fireworks creates a brilliant backdrop for the golden yellow greeting in front. And the words are incredibly meaningful, making this a great way to surprise a close family member, spouse or someone you hold very close to your heart. 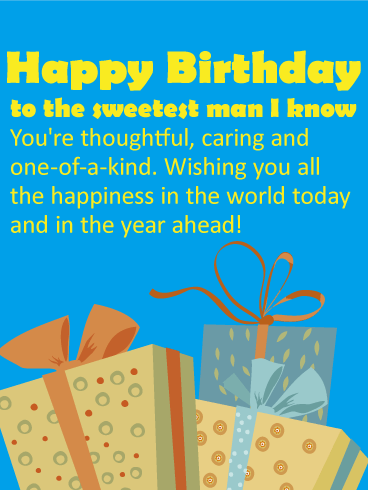 For the man who means everything to you, this birthday card will bring a smile to his face as he celebrates! A stack of festive gifts adds a fun, colorful touch and the message above comes straight from the heart. The perfect choice for your husband or significant other, reminding him of how special he is to everyone around him. 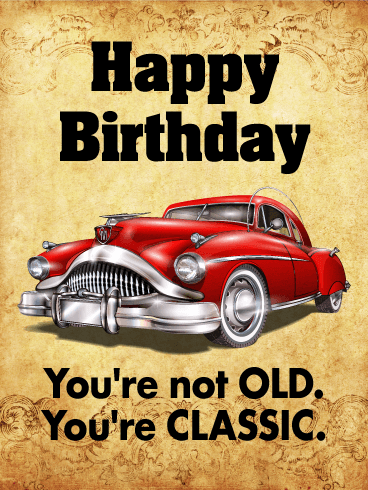 With plenty of style and sophistication, this birthday card will appeal to any guy you know. Whether it's a close friend, family member, co-worker or someone you’re hoping to get to know a little better, he'll appreciate the thoughtfulness of your gesture and the wishes you're sending his way today and in the year ahead! 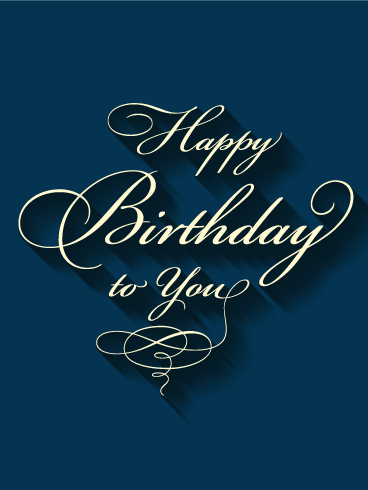 Whatever age he's turning this year, here's a birthday card that will get him in the mood to celebrate! Brightly colored confetti and festive presents, all wrapped up and waiting to be opened, create the perfect backdrop for the thoughtful message that sits front and center: "Knowing you is the best gift of all." What a wonderful way to make him feel special on his big day!